I have heard a large number of recordings of this symphony over the years and was fortunate to attend one of Leonard Bernstein’s concerts with the New York Philharmonic with Jeannette Zarou as soprano soloist at the University of Michigan in Ann Arbor in September 1967. Bernstein’s first recording with Reri Grist was my introduction to the symphony. From that time on this work has been one of my favorites. In addition to that recording, I have greatly admired those of George Szell with Judith Raskin, Jascha Horenstein with Margaret Price, and Lorin Maazel with Kathleen Battle, among others. I refer the reader to Tony Duggan’s MusicWeb International survey of this symphony for his recommendations among the many alternatives. Having listened to this new recording by Iván Fischer several times on different systems, but unfortunately on only two channels, I would without hesitation place it at the very top of the list. It is that good! This is largely because it sounds so natural. Fischer has developed his orchestra into a world-class ensemble with rich but luminous strings and wonderful winds. The recording balances everything with perfection and nothing sounds in the least bit contrived, but the symphony comes up fresh minted - an over-used phrase, but pertinent here. 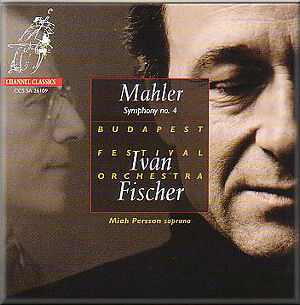 Fischer convinces as a real Mahlerian, with a judicious but very natural employment of rubato. It is interesting that while he seems so well suited to Mahler, his recording of Brahms First Symphony that I also reviewed for this website, falls short for that very reason. There the rubato feels imposed, applied from the outside, while here it is part and parcel of the work. He obviously has a greater affinity for Mahler than for Brahms. He is also meticulous when it comes to following the score and observing the dynamics. My reference recording of this symphony on CD has been until now Lorin Maazel’s and the Vienna Philharmonic, with Kathleen Battle singing the “Das himmlische Leben” song of the last movement on Sony, for its combination of radiant performance and warm, present sound. Now in direct comparison with the present disc, I find Maazel just a bit too mannered and Battle’s child-like voice rather affected-especially the stanza beginning with “Kein musik ist ja nicht auf Erden.” It is interesting that Maazel is slower in all four movements, though barely so in the second: Maazel’s timings are: I- 18:03, II- 9:28, III- 22:31, IV- 10:41 (see the timings for Fischer above). The biggest difference is in the finale, which seems very slow, though Szell took a similar tempo in his recording. The one movement where Maazel really scores, however, is the second movement scherzo, which he characterizes extremely well by bringing out the darker elements in the music. Perhaps Fischer is smoother and somewhat less characterful in comparison, but still detailed and idiomatic. In the other movements he is unbeatable. The playing of his Budapest orchestra is above reproach with particularly beautiful winds, especially the oboe and horn parts. Check out the oboe, for example, about five minutes into the third movement. The whole movement is gorgeous, with especial attention paid to the dynamics. Then, the finale is best of all. Miah Persson captures the innocence of the child without sounding childish or too sweet, just very natural and joyful. Listening to Raskin for Szell or Price for Horenstein here is enlightening. Both sound too mature, if not matronly, though good in their own ways. Then there is the disaster of Bernstein using an actual boy for his solo in his later version with the Concertgebouw Orchestra. It might have been a good idea in theory, but it just doesn’t work. Mahler intended the song to be sung by a female soprano with a child-like voice. Too bad, because otherwise Bernstein’s performance has much to recommend it. Reri Grist was so much better in the earlier performance, but Bernstein’s interpretation showed greater depth in the later one. The bottom line is that this new version of Mahler’s Fourth is now the one to beat. I am looking forward to hearing the recording in surround sound. In the meantime, look no further for your Mahler 4.